Let's say you have a product database that is maintained outside of JReviews. When you first setup your site you'll export this database to a CSV file and then you'll import it to your site. After that, it's a bit difficult to keep the information in sync when the updates are made directly to the external database which doesn't include the listing ID from your site. 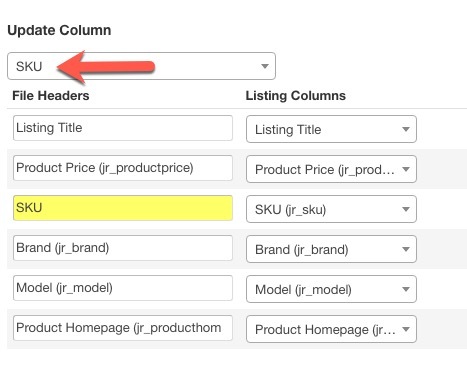 With the new functionality, as long as you have a unique custom field for the products, like SKU, you can select that as the "Update Column" and easily update records from the external database into JReviews without having to do any spreadsheet acrobatics to sync the two databases! Similar to the products database example, you can do the same with real estate listings, affiliate databases, job listings, and any other source where each record has a unique ID that you can use for updates. The possibilities are endless! The update is available right now via the JReviews App Store for all license keys with active subscriptions. Below you can see the new "Update Column" option which appears right after uploading the CSV file. First you select the "Update Column" and then you associate the File Header to the corresponding field in JReviews.